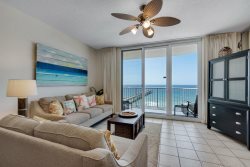 This bright and cheery 1 bedroom, 1 bath Gulf front condominium on Navarre Beach is the perfect place to stay for a family vacation. Enjoy "Navarre's Best Nest" with the unit sleeps up to 6 people and offers a fully equipped kitchen, dining and living room areas, Jack & Jill style bathroom with tub/shower, a king bed in the master bedroom, resort style built-in twin bunk beds in the hall, a queen sleeper sofa in the living room and amazing views of the Gulf of Mexico from the private balcony! We thoroughly enjoyed our stay in 1304E. And the waves were wild! Navarre team was good spirited and ready to assist in any way. . The grounds and pool were kept very clean.